There is no shortage of bible covers out there in whatever material you desire, polyester, “genuine leather“, whatever. Most of it’s crap quality and the prices show it. 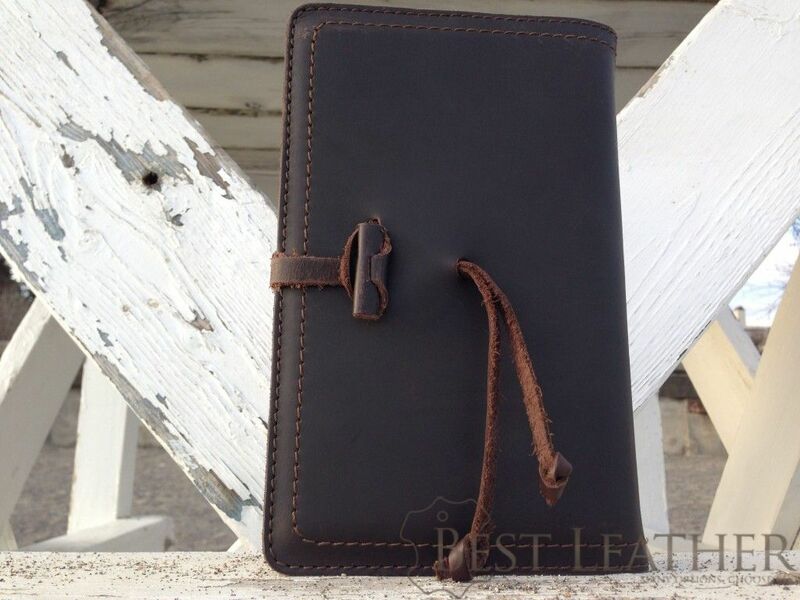 Here is the review on the full grain Saddleback Leather Medium Bible Cover. This is a hefty bible cover with an almost-simple traditional construction of one swathe of leather and tabs on each side to secure each flap of the book. 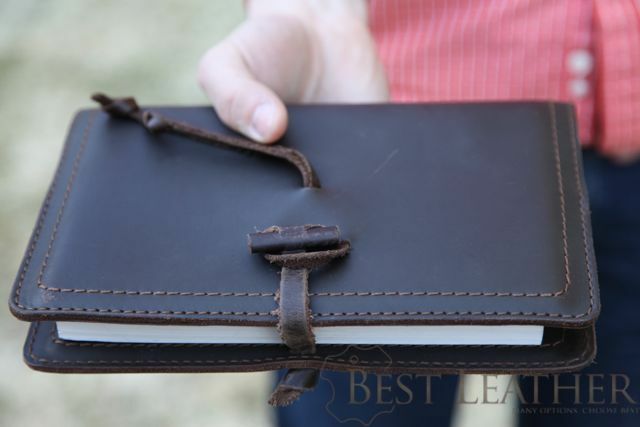 Unlike other Saddleback Leather products, the bible cover is not lined in pigskin which is perfect. The rough suede leather interior is fantastic looking. 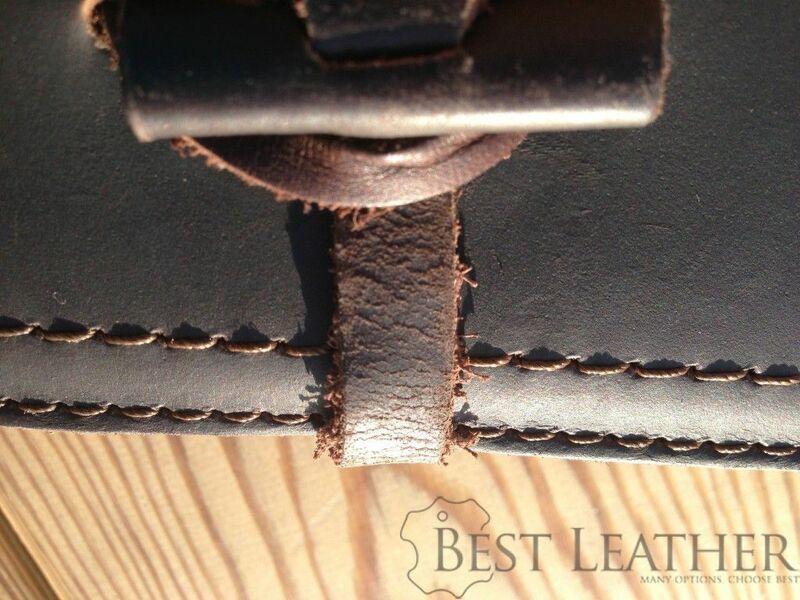 The leather on mine is 2-3mm and dyed completely through – as opposed to some leather companies who only dye the surface of the leather. The deep dye will keep the leather the same beautiful dark coffee brown for its entire life instead of wearing out to a lighter natural leather color. It is somewhat perplexing why the stitching proceeds around the whole cover when the only places that really “need” stitching are the 3.5 inch tabs on each side for the cover flaps. The continuous stitching does stay consistent and does have a nice symmetrical component. Perhaps the cover looked bizarre with only the tabs stitched down? None the less, the stitching is double layered and then duplicated so I can’t see this cover having any issues for a very long time. The thread is polyester so it has very good abrasion resistance compared to the common wax-covered thread. While the thread is pretty tough stuff as threads go, it’s not invulnerable. I have already had to burn a thread that has frayed on the spine. I have one concern about the 10+ year durability of the closure strip. In the photo below you can see how the strip is not full grain, but actually top grain (which is not as strong or thick as full grain). It looks like with daily use it will wear out. I’ve had the cover for a couple months now and this is what it looks like. You see the cracks in the leather and leather bits coming off? Every time the cover is opened this strip gets pulled through a tight hole which abrades it ever so slightly and the top grain quality loses bits of leather that get on my bible. Eventually it would be not surprising if there is nothing left there and it simply breaks. You can see how the closure strip rubs against the cover and could slowly abrade it. I will do a couple more reviews as the bible cover wears and look into this more. The below photo shows how much comes off with ten “tightenings”. You can see how the edge of the cover extends an inch or so past the bible. This is nice because that protects the edges of the bible’s hard cover from the punishment of being dropped. I should also mention that you will probably want a hard cover bible for this kind of cover since a softcover is going to have a harder time being restrained by the flaps as the bible’s cover flexes. This is a medium sized bible cover. For those of you who need dimensions it’s about 13″ wide and 9.5″ tall. Your bible should be able to fit into a 11.5″ by 8 3/4″ cover. I have a hardcover medium Foundation Publications NASB that fits perfectly with just enough wiggle room to get in nicely. To be honest, I don’t like the closure method Saddleback took on this. I can see how it works and it is perfectly functional, but to me it seems overly complicated when there are far simpler options. You can tighten the closure two ways but only one is the right way. You could pull the wrong end of the closure strap tight against the tightening string or you can pull the tightening strong (the long thin string). It seems like it would have been much easier from both a functional and manufacturing standpoint just to have a loop that the closure strap could slip through lengthwise and then straighten out, secured against the loop. Some people want to know if you can fit a Moleskin in the SBL bible cover. Not really, the standard moleskine notebook size is too small. If you really want to then check out the SBL Moleskin Cover, the fit and finish of it is much better for the moleskin notebook. The SBL Bible Cover is elegant in a rugged way but the strings hanging off it ruin the simple look for me. To do it again would go with the no-closure version and figure out my own solution. There are just too many string hanging off it and too many frayed pieces of leather falling off. The back of the SBL cover is much cleaner than the front. 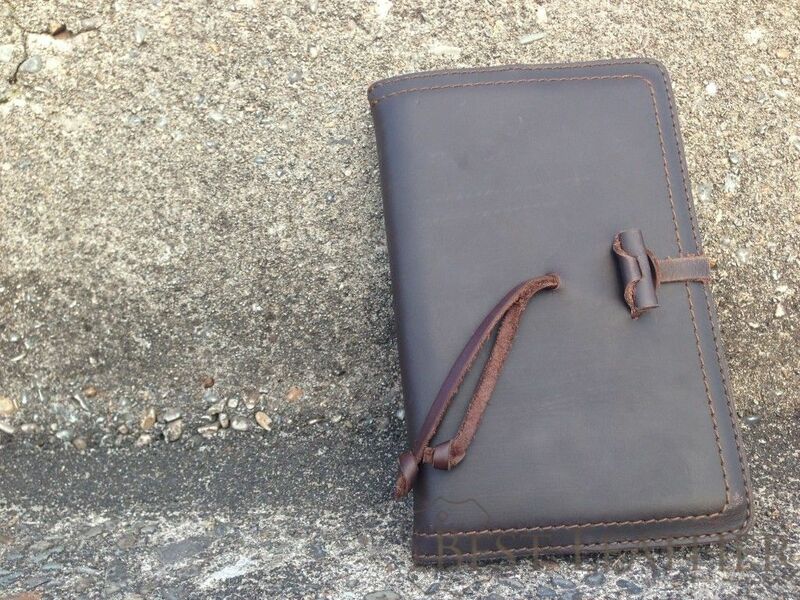 As for the functionality and durability of the cover, it’s a good product and will serve your bible well. The excellent thread, full grain leather (minus the closure strip), and double stitching make for an awesomely rugged bible cover. Regarding the closure, I would go with the SBL strapless variation if you agree with my assessment that all the dangling string is a turn-off. 4 Comments on "Saddleback Leather Medium Bible Cover ($35 – $43)"